People have been asking me how the lettuce in my hoop house looks after last week’s Arctic Vortex. Out here in the countryside we had one night of -20 degrees F then, three nights in a row of -13 degrees F. I was sure all of my lettuce would be dead after exposure to that kind of temperature. So, I waited a few days to dig out the snow away from the door so I could get in to take a look at my crop. As it turns out, most of the lettuce survived. The plants that I planted early in the season and had a chance to become established, came through nicely. The second crop — the ones I planted later in the season — did not make it. Those plants never had enough time to grow into strong plants before the extreme cold arrived. I should mention that a single layer of plastic greenhouse covering wasn’t the only thing sheltering the lettuce. 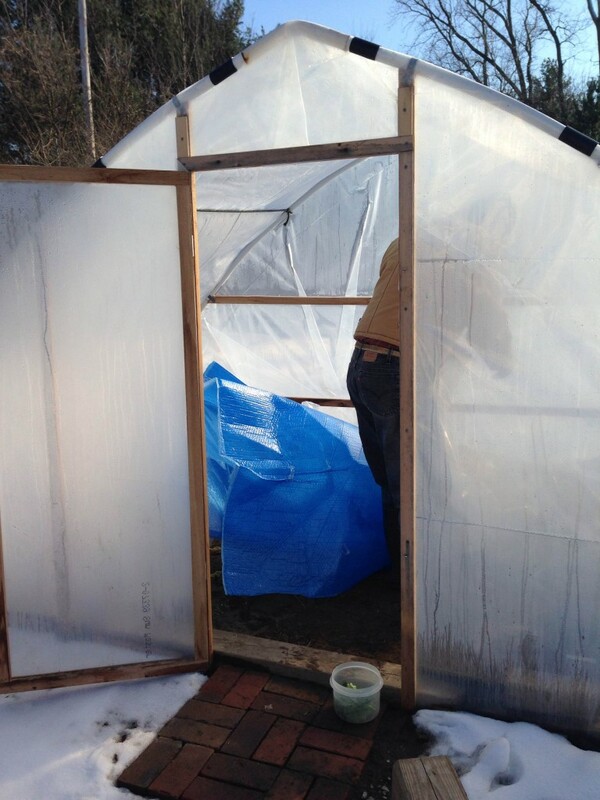 I also added an extra layer of plastic sheeting over the plants in a kind of hoop tunnel within a hoop house arrangement. Here I am picking some lettuce. The blue material is plastic bubble wrap. Then just before the Vortex really got cranking, I covered the inner tunnel with a layer of over-sized sheet of bubble wrap. I believe that is what made the difference between life and death for those plants. Now I’m back to harvesting fresh lettuce again and will probably run out of lettuce before winter is over.